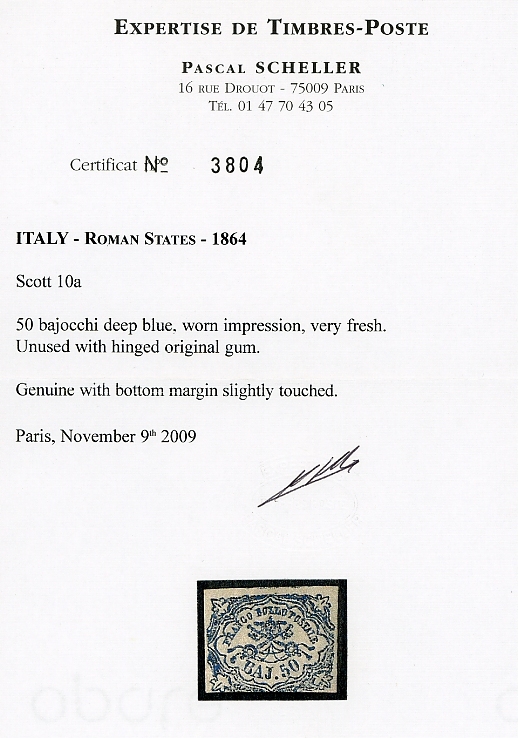 Pontifical States 1864, 50 bajocchi deep blue, from the WORN IMPRESSION, unused with full original gum, three wide margins, only slightly touching at bottom. A very fresh and fine example of this rarity. 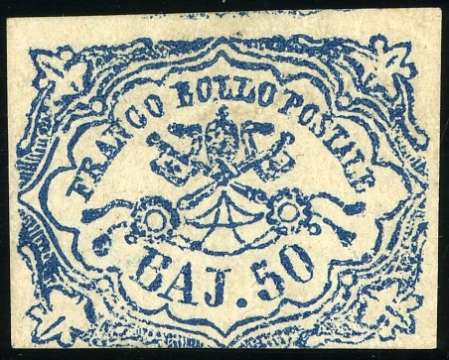 The first printing of this stamp was made in 1852 but in 1864 a second printing from the now rusty old plate was necessary, which always shows the characteristic blurry impression being printed from oxidized cliches. This stamp in unused condition is very rare, it carries its own catalogue number in Sassone: 12 = 37.500 EUR, Bolaffi 10 B = 48.850 EUR, Scott 10a. Certificate Pascal Scheller, signed by the expert Roger Calves (Paris).